Earlier in 2018, Instagram introduced an array of new tools and features. These tools have plenty of potential for businesses who are trying to stand out in their audience’s newsfeed. The following details the latest features on Instagram that can help promote your brand and engage more with your customers. 1. 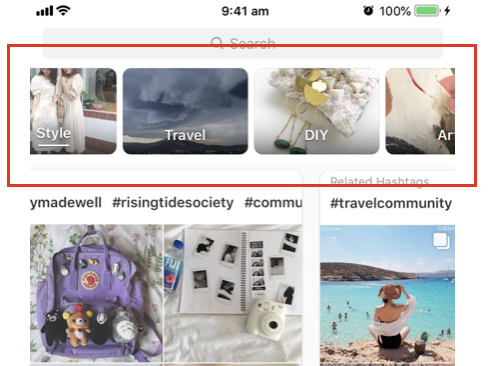 Instagram Topic Channels – these channels appear at the top of the ‘Explore’ section and show users different categories of posts eg. “For You”, “Art”, “Travel”. These will be collated, based on the user’s Instagram behaviour and interests. They offer a new great way to potentially connect with more members of your target audience who haven’t seen your brand yet. These topic channels show hashtags relating to the topic so boost your posts with popular and relevant hashtags to get more reach out of your posts. If people are searching for these hashtags, then they potentially will be your target audience and see your post. 2. Video Chat in Direct Messaging – Similar to Facetime, you can video chat up to four people at one time, with all of them being on the same screen. You can also screen-share and show them what’s on your screen while you video chat. Why Video Chat? This could be a great way to communicate with customers who have directly messaged you about concerns or a question. It’s helpful especially if you need to work through a screen to show them how to trouble shoot the exact problem they’re experiencing. It’s a faster and more convenient solution while achieving great customer service and hopefully exceeding customer expectations. 3. Add Music to Stories – choose music from Instagram’s music library to add to a Story. It contains a range of music, and you can choose a song through Mood, Genre or Popular. All music is free for commercial use. Playing music can help enhance a certain mood of your Story or give it more impact. Step 1: Tap on the smiley-face icon in the top right of the screen after you take a photo for the story. This will open up the page of stickers you can add to the story. Step 2: Scroll through the various genres and moods, or search for music on your own. Step 3: Choose the duration of the clip, and which part of the song you want to play in your story. Once the clip is added to the story, you can choose to have the song that’s playing displayed in three different styles, from the album showing to just the title of the artist and the song. 4. 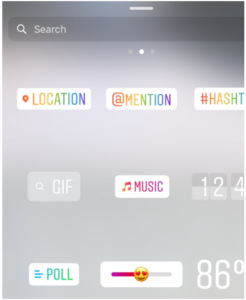 New Question Sticker – This new sticker for Instagram Stories allows you to ask a question, and the user can type a response. You will see all the responses privately. This tool will encourage engagement with potential and regular customers. Uses for the New Instagram Sticker: You can engage more with customers and collect data from the responses and interactions. Ask them what they think about certain products, gain their opinion or start a discussion. Since you can share these responses publicly on your Story feed, this allows you the ability to share consumers ideas or responses too. You could start a competition and the best answer or idea wins a giveaway or even do a quick Q&A if you’re rolling out a new product which people might have questions about. 1. Start by tapping the sticker button after uploading a photo or video to Instagram Stories. 3. Once you’ve written your prompt, place it wherever you’d like and share it to your story. Finally, make sure to thank or respond to your audience as this will hopefully encourage them to engage more in the future. 5. Instagram TV (IGTV) – A new feature that could be seen as the “mini-Youtube” of Instagram. 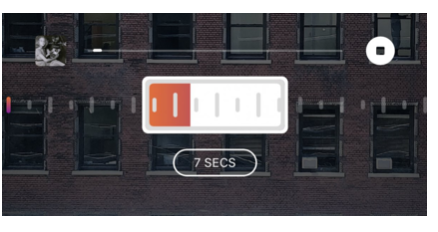 You can upload videos up to one hour. The content is meant to be ‘home-made’ videos, created by influencers and vloggers. The feature also has analytical capabilities so you can see who views, likes and comments on your video, as well as see your audience retention rate and when people swipe away from your video. How to leverage IGTV? IGTV can be a great way to engage your target audience with interesting content. If you’re already posting videos to your website then this would be another platform to post your videos or vice versa put all of your IGTV videos onto your blogs and website to keep traffic going to your Instagram. Being able to save old IGTV videos and create a collection is a great way to build a social media community, retain followers and customers, and further promote your Brand. 6. Shoppable Tags – a great feature for businesses with e-Commerce websites. 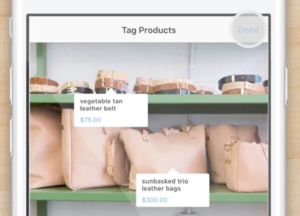 In images and videos, businesses can now tag their products. These tags can include the name of the product, its price and provide a link to the product page. If your products or services are possible to buy online, you should seriously consider this easy-to-use sales channel. The more opportunities your customer have to buy your product the more likely they will spend their money especially if it’s easy to access and obtain information.